Dishes served at Thanksgiving Dinners in the United States has definitely changed over the years. We might think of turkey “and all the trimmings” as typical Thanksgiving fare... but is that accurate? 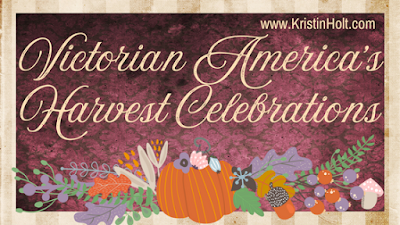 What did our Victorian-era American ancestors see as a proper holiday feast? Before we dive into the food, here's one little historical element I couldn't help but share. A full moon-- absolutely necessary. The Times-Picayune of New Orleans, Louisiana on December 1, 1840. And why on earth did a full moon matter? I’m guessing here. Completely guessing. “Over the river and through the wood, to Grandfather’s house we go”... Yes, grandfather’s. And yes, Thanksgiving. Not Christmas. The "High Offence", wherein Thanksgiving had no full moon, might have made for a dangerous drive home in the dark. In the 1840s, drivers might've had lanterns on their wagons, but travel was made infinitely safer by significant moonlight. The Plaza Hotel Thanksgiving Menu; The Las Vegas Gazette of Las Vegas, New Mexico on November 26, 1885. Also in Las Vegas, New Mexico, the Depot Hotel served a "festive pig", "frolicsome turkey", "meek antelope", "together with the delicious fruits, toothsome pies, sparkling cider, and a large menu of delicacies..."
Depot Hotel Thanksgiving Menu, The Las Vegas Gazette of Las Vegas, NM on November 26, 1885. In the following 1889-published menu, the Vermont Journal of Windsor, Vermont, suggests a breakfast (for Thanksgiving Day) as well as Dinner. Note the breakfast includes dishes like stewed oysters, broiled quail, baked sweet potatoes, and lamb chops. (Who'd be hungry for dinner?) Dinner includes Blue Points (more oysters), broiled smelts, sauce tartare, duchesse potatoes, ragout of mallard duck, escarole salad... oh, and roast turkey, among about 97 additional menu items. A Thanksgiving Menu (breakfast and dinner), published in Vermont Journal of Windsor, VT on Nov 30, 1889. Thanksgiving Menu: Lawrence Daily World of Lawrence, Kansas on November 23, 1895. Notice the oysters on the Thanksgiving menu-- in Lawrence, Kansas. Oysters (and other seafood) were primary dishes offered in New England states and all up and down the Atlantic seaboards. I suppose I shouldn't be surprised that with the train and refrigerated railcars came the availability of customary specialty foods--even in landlocked Kansas. A decade earlier, also in landlocked Kansas, The Leavenworth Times of Leavenworth, Kansas noted "The Parsonage House Offers its Guests a Splendid Spread To-day", including "OYSTERS. Raw, Escalloped, and Stewed." Parsonage House Thanksgiving Feast Menu in The Leavenworth Times of Leavenworth, KS on November 25, 1886. St. Joseph's Union Hotel and Restaurant proudly served oysters, boiled tongue, roast loan of beef, roast turkey, and oyster dressing (and lima beans) for Thanksgiving. Thank goodness for the pineapple ice cream. Thanksgiving Menu at The Union Hotel and Restaurant; St. Joseph Gazette-Herald of St. Joseph, Missouri on November 29, 1900. The following 1892 menu from Osage City, Kansas might not have offered oysters, but they did suggest "walnut catchup", as well as raisins and nuts. Another article I stumbled across commented that no Thanksgiving feast would be complete without raisins and nuts. Suggested Menu in The Osage City Free Press of Osage City, Kansas on December 1, 1892. The Argus and Patriot of Montpelier, Vermont, compares "OLD and NEW Thanksgiving Dinners" on November 27, 1895. Part 1. The Argus and Patriot of Montpelier, Vermont compares "OLD and NEW Thanksgiving Dinners" on November 27, 1895. Part 2. Yes, oysters made the cut for both "old fashioned" and highly "new fashioned" (circa 1895). Note the requirement for "fancy": "The modern Thanksgiving dinner must be good and well cooked. It must contain a variety of dishes, but they must be dainty and have sauces and dressings and garnishings [sic] suggestive of the day." 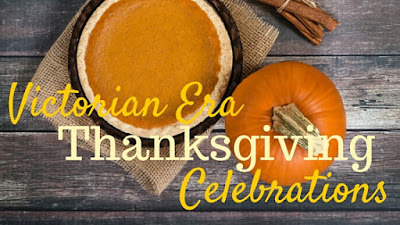 I must say I LOVE the inclusion of ice cream in a modern-day Thanksgiving feast. 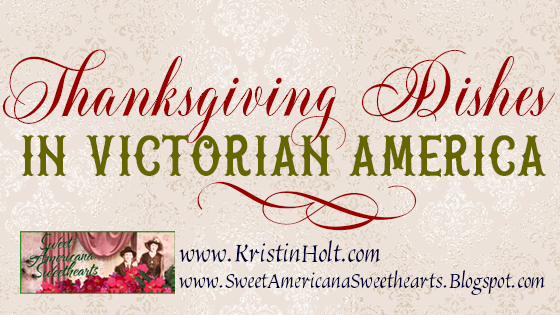 Have you heard about my Thanksgiving-centered new release? Learn lost more about Unmistakably Yours here. Don't they, though? I'm glad life is simpler now. Especially on Thanksgiving Day. Thanks for reading and replying, Susan. Much appreciated. A very interesting article. I'm thinking to a very old italian cookbook that my mum gave me. Menus for important events in the past were really complicated! You're very right-- those antique recipes were complicated! I can't imagine cooking over a coal- or wood-burning stove, with recipes written as paragraphs, and trying to keep up! Where in the world do you dig to find all this wonderful information of times gone by, Kristin? :) I love your posts! And I loved reading about Thanksgiving dinners! Thank you for all your research! BLESSINGS! So very sorry MONTHS have passed since your post asking for my source. I'm happy to share. I subscribe to Newspapers.com (and find it's worth every single penny). What Did the Children Do? 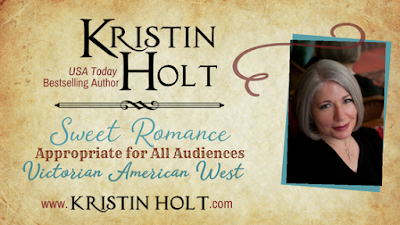 A Christmas Release and an Excerpt!